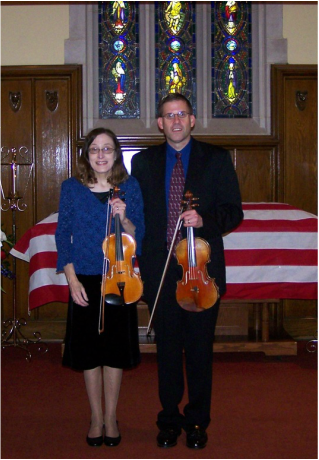 Welcome to the website of Mike and Diane Hall, violinists. Thank you so much for visiting. Here you can learn a little about us and the musical services that we currently offer. We have played in venues as diverse as church weddings, an annual breakfast for Child Evangelism Fellowship in Cedar Rapids, and at a University of Iowa dialysis unit. To find out more about our program and the services we offer, click here. To hear some clips, check out this page.